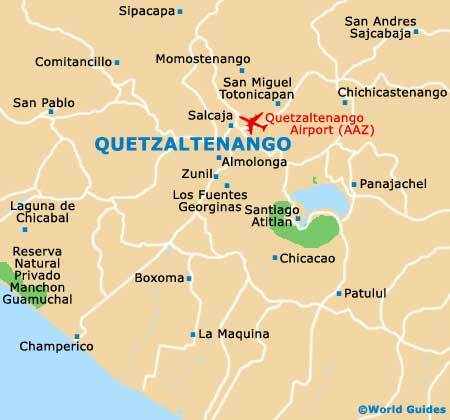 Quetzaltenango is set at an altitude of around 2,300 metres / 7,545 feet above sea level, in Guatemala's Western Highlands. Although the daytime climate can be balmy, the temperature often drops to freezing, especially in the winter months and evenings, and early mornings can be cool at any time. This is a sizeable city, yet its buildings are mainly unheated and constructed of concrete blocks, making night-time quite cold. Layered clothing is essential here. Quetzaltenango has two seasons, the rainy and the dry. The rainy season runs from May to mid-November, with downpours lasting two to three hours occurring daily, normally in the late afternoon. During the dry season, from December to May, there is often no rainy weather at all in the region for several months. Overall, the city's climate is referred to as temperate, with warm days and cold nights. Guatemala's temperate climate makes it a year-round destination, particularly for outdoor activities, although the range of temperatures found in the highlands and mountainous regions should be taken into account if a trip in the winter months is being planned. From November through to early spring, freezing temperatures (especially at night) can occur and therefore warm clothing should be brought. The high season in Quetzaltenango takes place during the summer months of June, July and August, although the daily heavy rains will require at least an umbrella and maybe a waterproof. If touring the region, remember that there is a strong contrast between temperatures in the lowlands and in the mountainous areas, making layered clothing the best idea.